Transfers round-trip to and from Helena outside of complimentary times are $160 ($80 per trip). Transfers round-trip to and from Great Falls are $300. Please e-mail patty@rockingz.com to confirm details for pickup and dropoff times and locations, including flight numbers if necessary in the week before your arrival! If you haven’t heard back from her or you have flight delays, call or text 1-406-465-5534. Gratuities are much appreciated by our staff! 15% is normal in Montana. There is a 2% bed tax that will be added on to the total package. Transfers if they are outside of complementary times. Any rodeo or other admission/entrance fees. Arrival at the ranch is near midday. Orientation will include an introduction to your horse starting on the ground with the Seven Games developed by Pat Parelli. When you are ready, you will be introduced to how our horses are trained for riding them and set out in your own time depending on your own abilities and confidence level. Then you will ride, play, relax and restore yourself as you wish. Our schedule is very flexible because we personalize it to you. 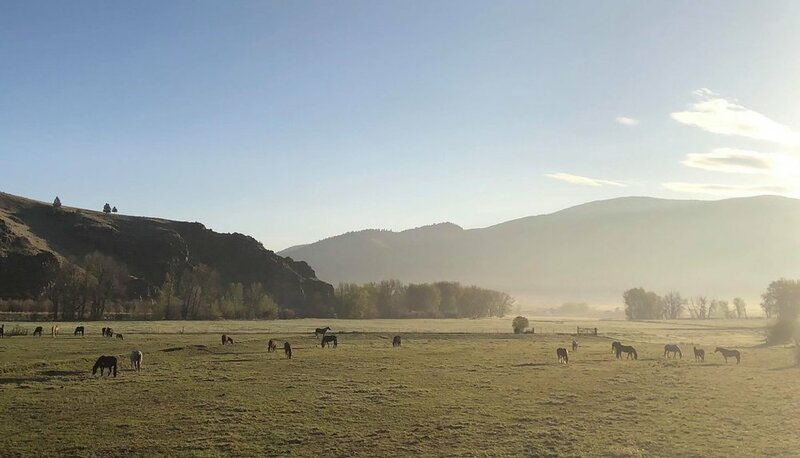 Your days on the ranch are spent on long rides, short rides, cattle work, arena work, ground work, playing at liberty, playing in the creek and generally relaxing so much that you sleep very well at night after dinner. Departure time is before eleven. Sunday arrivals and Saturday departures at select times to and from Helena are included, but transfers to other airports and/or at other days or times incur an additional charge. The herd milling about in the field by the entrance on a crisp spring morning.